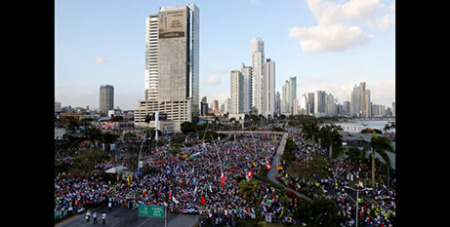 The Archbishop of Panama told youth gathered for the opening Mass of World Youth Day in Panama City yesterday that change in the Church and in humanity is in their hands. Source: Vatican News. Archbishop Ulloa’s homily was a summary of his own, and of the young peoples’, expectations for this event which takes place, at the international level, every three years. One of the key passages of the archbishop’s homily was a confession: “Sometimes we adults think that young people don’t want to listen,” he said. “You need direction and accompaniment from us,” he continued, “but, above all, for us to listen to you." Archbishop Ulloa continued by admitting that young people are “not easily impressed”. “Young people search for witnesses," he said, “references filled with content and experience.” Rather than listening to someone talking about God, “you search for someone to show you God with their life," he said. Archbishop Ulloa quoted Pope Francis who frequently invites young people to “go against the flow” as they try to live holy and transformed lives. The Pope often says that “holiness has its risks, challenges and opportunities”. But “we can all be saints”, the archbishop said. He then went on to give a definition of sanctity: “A saint defends migrants, seeks justice, prays, lives, and love their community, is joyful and has a sense of humour, always struggles, gets out of mediocrity, lives the mercy of God, and shares with their neighbour”. Finally, Archbishop Ulloa announced a special gift to the young people on behalf of the Pope: the DOCAT Book and App, an instrument that he said will strengthen young leadership by making them more familiar with the Social Doctrine of the Church.